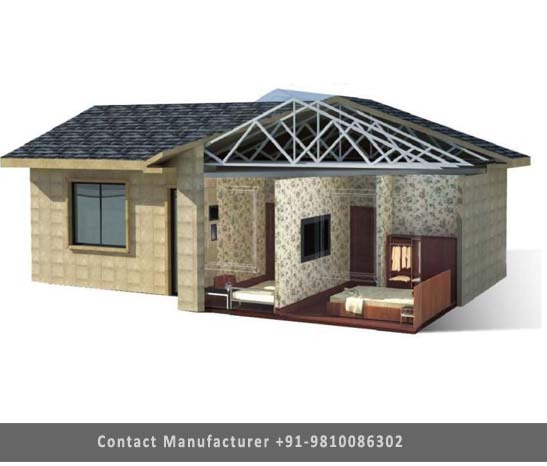 Prefab Light Steel Villa Manufacturer in Delhi, Prefab Light Steel Villa Supplier in Delhi, Prefab Light Steel Villa in Delhi. We design environmental economical removable house, including normal, standard and high three levels. According to consumer's requirement, combine with standardized modules to present concise and nice appearance, security construction, safe application and standardized operation temporary construction idea. It's industrialization production, storage capability and recycles in use housing product. Steel space frame is constituted with steel rods and joint balls. It's suited too big span buildings, like airports, storages, stadiums. Arched space frame can span150m. Stainless Steel Spaceframe has attainment rods and balls, that is why it is easier to transport and erecting a structure. Low-Cost housing or Affordable housing refers to housing units that are affordable by that section of society whose income is below the median household income. The activity staff quarters is steel structure. Its characteristic is: can disassemble, convenient transportation, mobile convenient, the activity room is located in the hillside, the hill, the grassland, the desert, the river. Do not take up space, can be built into 15-160 square meters, mobile health clean, indoor facilities are complete, the durability of the stability of the trailer is strong, beautiful and easy, is family tourism, resorts, villas, places of entertainment's first choice. Designed according to customer's requirements, exquisite and elegant, good thermal insulation performance, warm summer and cool summer, the activity room is mostly finished in the factory. •FOR STAFF QUARTER AND LOW BUDGET STEEL HOUSE MATERIAL SECPECATION:- Wall panel(50mm cement wall), M.S Tube Structure-(Column,Beam,Truss, Purlin), Roof -(color coated profile sheet), Window –aluminum sliding 1200x1000,Door-laminate Door,0.75mm- PVC flooring and Paint-(Oil bond distemper). •FOR STEEL VILLA MATERIAL SECPECATION:- Everest Dry Wall, M.S Tube Structure, Color Coated Profile Sheet in Roof, Laminated Door with the frame, Aluminum / UPVC Window, Sanitary and Plumbing, Electrical (Points only) Vitrified Tiles 800mm X 800mm and 600mm X 300mm in Toilet Wall, Outer and Inner Paint.